Associated Press photos Jackie Young helped Notre Dame earn its eighth straight No. 1 seed in the women's NCAA Tournament. Young and the Irish beat Louisville, also a No. 1 seed, in the ACC Tournament. SOUTH BEND – Notre Dame was in the middle of practice. Then, it was a No. 1 seed in the NCAA Tournament. 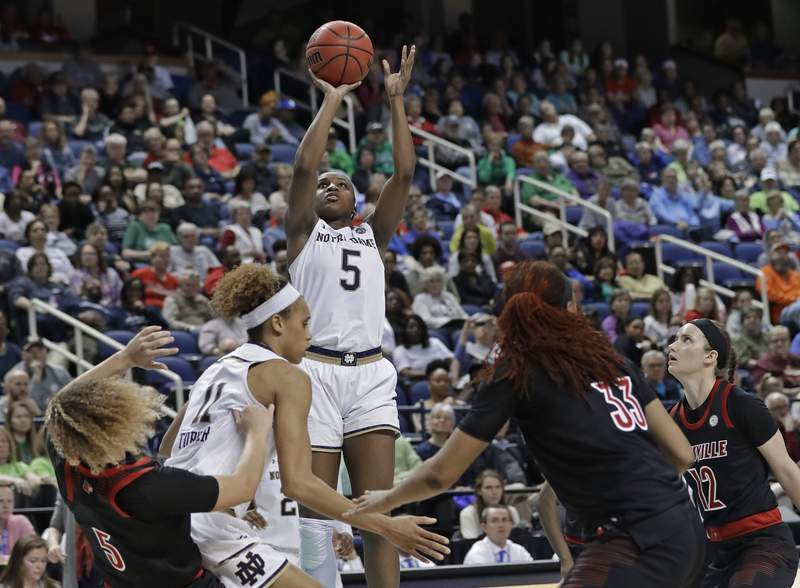 The Irish women's basketball team earned one of the four top seeds for the eighth consecutive season Monday and will begin defending its 2018 national championship with a matchup Saturday at home against Mid-East Athletic Conference champion Bethune-Cookman. The Wildcats are making their first-ever appearance in the tournament, while the Irish are in for the 24th straight year. The Irish (30-3) had planned to practice until 5:45 p.m. and then watch the NCAA Selection Show at 7, but a snafu at ESPN caused the entire NCAA Tournament bracket to be released early and the network scrambled to move the selection show up two hours. McGraw wasn't happy to have her team's practice cut short, but she said the Irish were planning on taking at least one day off this week anyway. She expects them to be even more focused for practice today, when game-planning for their tournament opponent can begin. Bethune-Cookman (21-10) won the MEAC Tournament for the first time since 1984 and will be making its fourth straight postseason appearance after three trips to the WNIT. The Wildcats are led by 5-foot-8 senior guard Angel Golden, who averages 19.7 points. If Notre Dame gets past the first round, it will face the winner of an 8-9 matchup between Central Michigan and Michigan State. The Irish will host the first two rounds and, if they advance further, will play in Chicago for the Sweet 16 and Elite Eight. Notre Dame comes in as one of the hottest teams in the country, winners of nine straight games. The last of those was an impressive 20-point win in the ACC Tournament title game over Louisville, which also earned a No. 1 seed Monday. McGraw said her team had been slogging through the regular season with one eye on the postseason when it lost a couple of midseason conference games to North Carolina and Miami. Those defeats refocused the Irish and led to a late-season surge. “Just having those losses really helped us up our intensity,” said forward Brianna Turner, the ACC Defensive Player of the Year. “Especially the ACC Tournament, we came in, we didn't want to have any close games. We wanted to come in and dominate, which I think we really did. The Hoosiers (20-12) reached the NCAA Tournament for the second time in four seasons after going 14 years between appearances. The Hoosiers received a No. 10 seed and will face No. 7 seed Texas at 7 p.m. Friday in Eugene, Oregon. Indiana was one of the last four teams in the field, according to the selection committee. The NCAA bid is only the sixth the Hoosiers have received since the team began playing in 1971. Indiana has won only two NCAA Tournament games and has never advanced past the second round. If the Hoosiers win their opening-round game against the Longhorns (23-9), they'll take on the winner of No. 2 seed Oregon and No. 15 seed Portland State. A second-round matchup against Oregon would be a home game for the Ducks (29-4).